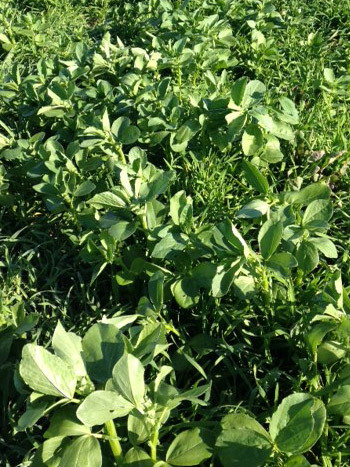 This cover-cropped field of bell beans, with a nurse crop of winter rye and oats, was a trial to evaluate nitrogen-fixing fall-cover options. The bell beans are starting to bulk up and to some degree the oats/rye has suppressed annual weeds. Planting date: September 2. Image date: October 20 (approximately 7 weeks). Albion, Maine. Latitude: 44.4°N. Legumes and grasses grown together balance the carbon-to-nitrogen ratio in the soil after plow-down. The legumes, rich in nitrogen, break down quickly, while the carbon-rich grasses take longer to decompose. Growing the two together makes nitrogen available to help break down the grass residue and reduces the amount of time that must elapse before a subsequent crop can be planted. A faster-growing crop such as oats or winter rye serves as a nurse crop to shelter less-robust, slower-growing plants such as red clover or sweet clover. Grasses establish quickly and prevent the growth of weeds that would otherwise compete with the legume. Low-growing crops and taller crops planted together cover more of the soil and do a better job of preventing erosion and weeds than a single crop alone. Sorghum grows tall, and cowpeas grow low; together they shade the soil and prevent weed seeds from germinating. Legumes augment nutrient content of a hay crop that is to be used for livestock. Combinations of cover crops reduce the risk of crop failure and allow for differences in conditions across a field. In spots where a legume doesn't establish well, the grass may do better and vice versa. An Introduction to Cover Crop Species for Organic Farming Systems, from the eOrganic network. Overview of Cover Crops and Green Manures, by ATTRA, the Sustainable Agriculture Information Service. Byczynski and her family have been growing vegetables and cut flowers since 1988, selling through CSAs, at farmers' markets, to chefs, grocery stores, and florists. They currently grow cut flowers and hoophouse tomatoes on about 2 acres of their 20-acre farm near Lawrence, Kansas.